The hybridized Langstroth box sat on top of the TBH for weeks and, despite having to enter and exit through the TBH, the bees would not move down into it. 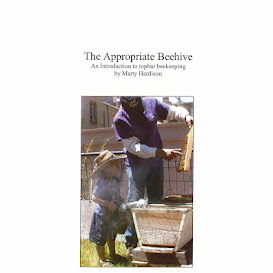 The original plan was to let the bees build up in the hybridized box and to crowd them into moving down. But after having swarmed, the colony wasn't crowded at all, and probably wouldn't be for a while. So we decided to just move the bees down ourselves, once all the bees hatched out of the Langstroth frames. A little bee math and the Langstroth box is gone now, and all the TBH requires now is maintenance. The observation window makes it easy to watch the bees progress, so we can give them fresh top bars to work on as the colony grows. We provided them with 10 drawn combs, and they have drawn 7 of their own, so they are well on their way to establishing themselves. The first round of brood is now of foraging age, just as the Linden flow is starting, and there is tremendous flight traffic through the Backyard now. The bees could not have timed having a large force of foraging bees better, so I have little doubt that this small colony will survive the Winter. Warré Top Bars are traditionally "pinned" into place. Our hive has a few non-traditional top bars, and I lost some pins, too. Since hiving the swarm bees, we've been in the Warré Hive twice, and there are definitely things I don't like about it. I didn't care about these things when we used a Warré box as a super, but now that we have bees living in a full-fledged vertical hive, my opinions have changed. #2 Rebates Maybe it's my hive tool, maybe it's me. Digging around to lift a top bar set into a rebate is clumsy in comparison to prying up a top bar in a hTBH. Bees don't like clumsy. BUZZ!! Some Warré hives come with frame spacers built into the rebate, which I suppose could be helpful if you've dropped your pins in the garden. But I am very glad ours doesn't because these bees are super propolizers. Pins or not, those bars would be a bugger to get out. #3 Fixed Combs I guess Abby Warré didn't have to worry about city code, so Warré top bars are traditionally carefully spaced and pinned (nailed) into position. With nailed-in top bars, a Warré is a "fixed comb" hive. To be legal in Colorado, however, the combs need to be inspectable so should be "movable combs." I modified some top bars to accept self-spacing side bars, which will both eliminate the need for nails and also allow for removal/inspection of the combs. At the moment, there is a chunk of brood comb suspended in a wire cage, which is keeping the roof from sitting properly. After the bees have hatched out, we'll put in some modified top bars. Here's a preview. Giving the bees a piece of brood comb to replace the one we're taking out. The idea for the modified frames came from here. If they work out well, or if they don't, I'll share with you as we learn to work this new hive. A true TBH (no frames) with 19.5" top bars is not a great idea for warm environments. Combs that large are liable to collapse from the weight. Just something to keep in mind, as you start to get creative with your bees. They do inspire us, don't they?